I was a little surprised to find that no-one I've asked agreed with my last post criticizing Peter Eastgate for auctioning off his bracelet. I think it is a matter of interpretation. I was interpreting his action as almost a 'middle finger' to the poker world several months after quitting, and saw it as ungrateful doing that to something that had given you so much. Hence the blog post. So perhaps I was overly judgemental on Peter, but I stand by the fact I would never sell a bracelet if I were ever to win one. I mean, I was pretty upset that I didn't get a trophy for winning a UKIPT side event (yes, thinly veiled brag, sorry). This might be a symptom of the fact I am a hoarder. It drives my girlfriend crazy, I am so reluctant to throw anything out! I still own clothes I haven't worn for 5 years lol. But I guess nothing can take away the result on your Hendon Mob Database page, and if I'm going to criticise Peter for selling his bracelet, then I should probably rant at Phil Hellmuth for giving his bracelets away as presents to his family, which would be rather harsh. GL to Peter in whatever he chooses to do. He was always a class act at the poker table. Which is more than can be said for what I just witnessed in the PokerStars.net Big Game episode I just finished watching. I'm a little behind the times on this, as it caused a bit of a ruckus a few weeks back. 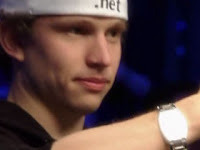 Basically Tony G and Daniel Negreanu got totally out of line on Andrew Robl. For Tony G to call the clock on Andew Robl in a hand he wasn't even involved in (bearing in mind this is a cash game with no increase in blinds or whatever) is just such terrible etiquette. Robl ended up making a bad fold, which he might not have made otherwise. Although Tony G is often entertaining, even (or especially) in his berating of people, he sometimes oversteps the mark so incredibly (or perhaps when it's not Phil Hellmuth it's not as funny?). Also, I've always quoted Negreanu as being my favourite poker player ever since I started playing, but his usual likeability was certainly not evident in this episode. I felt for Robl watching all that go down, and he really sticks up for himself in this blog post he made after it aired. Tony G and Negreanu have since posted on the subject, but meh, Robl came out looking best on this occasion. 6 Comments to "Eastgate: the flip side & PokerStars.net Big Game drama"
You are linked. Thanks for linking mine. I stumbled across your blog fancy swapping links? I thought it was a shame the way they "ganged" up on Robl. I've noticed that old school live pros tend to get excited when they outplay the "2nd gen" internet guys. Robl dealt with it well however I'd love to see how the likes of FullFlush would act in this situation. :D Keep up the good work. np JT, Mr B you're linked up. Yeah Fezio, it was pretty dirty, I think Robl handled it really well, he must have been super pissed on the inside! Schwartz in that spot would be funny! I know it's charity, but it's still a classless move. Would the Red Sox sell their World Series Trophy for charity? No. Some things are priceless. And to put a price on something that so many of us can only dream of achieving hurts.